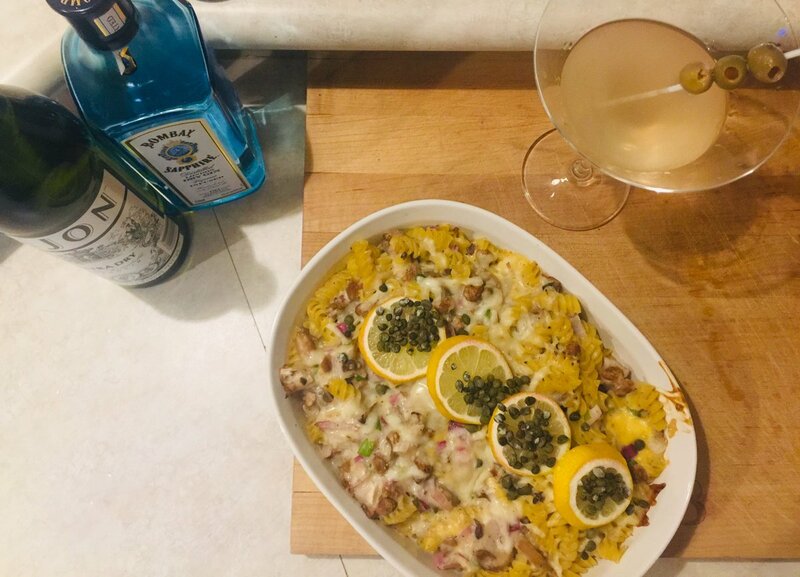 Well, while I wouldn’t eat the faux tuna plain (as you tend to find with some faux meats – which just don’t quite have the same taste and texture as the actual meat you’ve grown up eating), it does taste quite amazing in a casserole, I found out this last weekend! The yummy lemon pepper seasoning it comes with really delights the taste buds! Top this casserole with more squeezed lemon and it is downright delightful! Anyway, read on for my amazing Boyfriend’s super yummy vegetarian/vegan tuna casserole! Saute together red onion and mushrooms (you can skip this step if sauteing – like me-makes you nervous!) Cook Pasta according to directions. Mix all ingredients well, in large bowl. Pour into casserole dish that can be placed in the oven. Sprinkle with shredded cheese or vegan cheese. 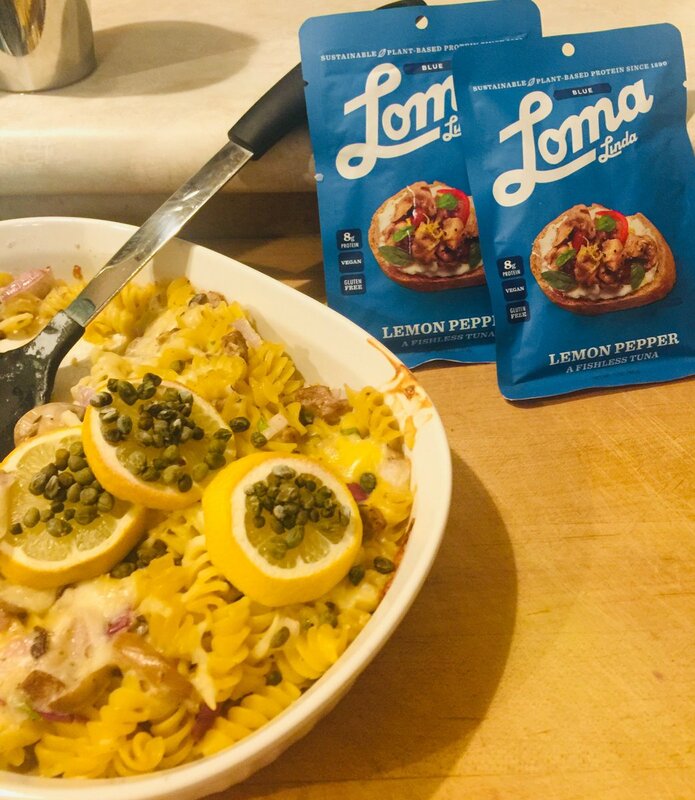 Top with sliced lemon and capers placed on top. Bake at 400 degrees for 15 mins, or until top looks lightly browned. Voila! That’s it! Enjoy! 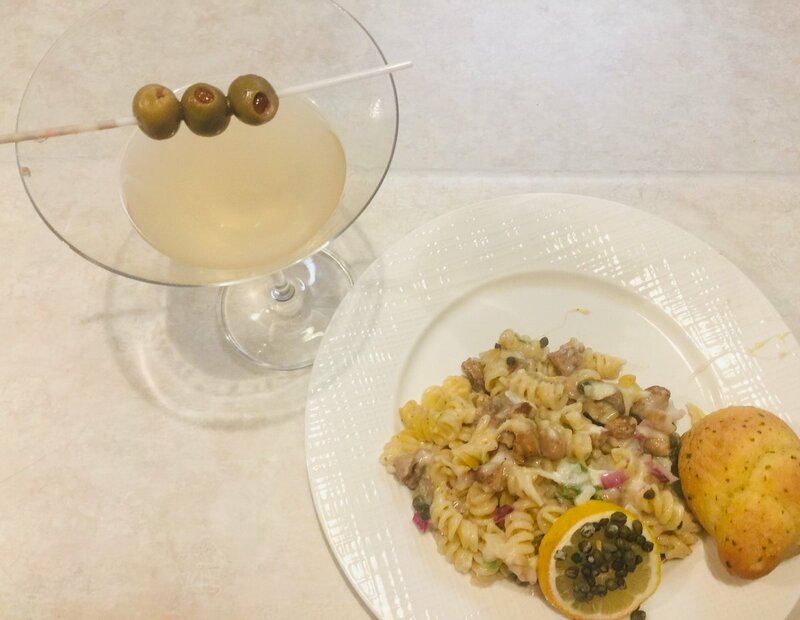 Serve with Dirty Martini – or drink of choice! Did you try out this recipe? Let me know your thoughts in the comments below! Should I keep letting my boyfriend cook for me or start doing it on my own? Be sure to Follow MyStyleSpot on Instagram and Facebook for more yummy food pics and recipes! I had no idea that faux tuna existed. I’ll look for it.